I while ago I said that I had ordered the above jilbab from Masoomah Jilbabs - I have since received (and returned..) it and have decided to write a review on the site and the product. Aesthetically speaking and by comparison to popular fashion sites, it's not the best by a long shot; but by comparison to popular abaya and jilbab sites, it's quite average. In terms of ease of use, it's relatively simple to navigate and order from. I has a very wide selection of jilbabs and abayas as well as scarves. Too informal for my liking: I was called up by a woman from Masoomah asking me to text her my sizes. Although she was friendly, I didn't feel it was professional enough for a company that started in 2001. The jilbab arrived in relatively good time considering that they alter the garment to your size. P&P was well priced. I am a firm believer that you can tell the quality of an online company from their returns policy. In order to return an item at Masoomah, you have to email the company telling them that you want to return it and then they email you the returns address. You then must pay to return it unless it is faulty or incorrect, in which case they will pay. This procedure is far to long-winded and will make me think twice about purchasing from Masoomah again. I think the abayas and jilbabs are very well priced, with a basic jilbab costing around £35. The tweed one above was £31.99. 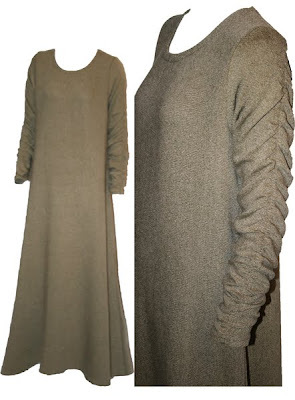 - Where else can you get a tweed abaya?! Even though the review sounds a bit harsh, I would actually recommend the site because of it's wide range of jilbabs, good prices and most importantly, it's safe to purchase from. Good for a full time jilbab wearer, but just not for me. Zaenab, sorry for the off-topic post......again. Yikes, I'm on the verge of buying something from them. Its making me think twice. Indonesian Prince: Lol that's OK, it was quite interesting actually and really well written (apart from some racist connotations..). C: I don't mean to stop people from buying from there, that's the last thing I want to do! But I'm only giving a neutral, honest opinion. Please take a sec to check out my latest blogpost! Spread the link and provide an easy way to donate to the flood victims in Pakistan inshallah! Please pray for our brothers and sisters in Somalia and Yemen. Situation is getting crazy there. I first ordered from Masoomah 2 years ago and now that's all I wear!! I love the fact that you get a really personal and thorough service from a conscientious sister who wants you to have something you feel really good in and that fulfils all the requirements of jilbab. I recommend this company to everyone...and now all my friends wear Masoomah jilbabs too!! And I have the green the green,tweed one you ordered and not only do I love it but I ALWAYS get complimented when I wear it!! I can't even count how many times I've seen sisters wearing really nice jilbabs and when I asked them where they bought it they said "Masoomah"! Asalaam alaikum waramutulah wabarakatu. i recently purchased this same tweed jilibab,masha Allah its a very lovely one.this was actually the jilibab that attracted to the site through a recommendation of a friend and i havent regretted my purchase and many others that i have made after this one. i love the blend of colours cos it not just green but blended with something like beige. the very first time i wore it, i was complemented throughout the day by fellow sisters who even asked me where i got it from and i recomended masoomah. my friends also loves it and they are now planning to get the same jilibab. i love the way it doesnt cling to the body and the arm design is quite fabulous as it had an extra touch to the jilibab. i like the informal approach of the company because it shows me that this isnt just another money making comapny but a company that aims to please its customers.